Your garage door is the largest moving component in your home. A huge amount of force is required for it to open and close on a daily basis. This is where your springs come to play. 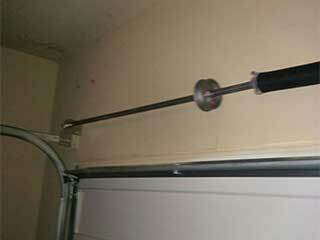 Undoubtedly the most important part of your garage door mechanism, they will wear down over time and eventually break. Most of them last for approximately 10,000 cycles. How can I Identify a Broken Spring? If your door is heavy to lift, opens only halfway up, or you have simply heard a loud snap in the middle of the night, chances are you have a broken spring. Never attempt to repair these springs on your own, or you will be in danger of suffering an injury or property damage from the extreme tension these springs are under. Once you establish your springs are no longer operational, you will have to have them replaced. Most typically, in a pair, as both springs last roughly the same amount of time. An untrained person trying to repair broken springs will have themselves exposed to great danger as these springs have enough power to damage your property or cause serious harm or even death. Every year, over 30,000 people are involved in garage door-related injuries, with DIY repairs of torsion springs being the leading cause. With us, your safety is guaranteed, and you have peace of mind knowing our licensed technicians will handle the job with expertise and competence. We also carry a wide range of replacement parts from the finest manufacturers across the country. We put quality first by providing you with the highest-quality components, offering the best efficiency in the long run. We are committed to providing outstanding service with which you will be completely satisfied. Schedule an appointment and we will repair your broken springs and get your door to its former glory quickly and affordably. Let our team take care of it for you!